… PowerShell will try to convince me, that 2 Bars are greater than 10. In world of strings that’s true. In world of numbers – not so much. To be honest – for me that’s huge flaw of that approach. It looks nice, but that’s not usually what I’m after. I want PowerShell to give me information first, look nice later. So what could one do? Today I would like to write few words about why you shouldn’t work too hard with creating output when PowerShell can do the work for you. Scripting, as I see it, is a way of taking stuff that “is there” and force it to do my job in a way I want it to be done. If there is something that will do job for me – I will use it. If not – I will create it. So my role is just to build the bridges, not whole road next to the old one. Obviously, at times you do not know that road already exists. That’s where stuff like Scripting Games help a lot. I for one learned few neat tricks already. But if you fail to see highway and claim to be advanced scripter – be warned, I won’t praise your rocky road that you’ve created next to it. To the point. Hey! Don’t *break* my pipe! I’m still pretty overwhelmed with number of scripts this year in Scripting Games. While I’m on my “Mission Impossible” I noticed extensive use of break keyword. I commented on it a lot in Beginner 3, but would like to show you why I do not like this as a way of ending your functions and/ or scripts. I mean, it’s perfectly fine if you use it with what I will show you today in mind, that is: if you want your function/ script to be destructive and break things when you see an error. But if your function/ script is only getting some info from my system and I won’t get full information (like in Advanced Event 2) without admin rights – why do you break things? Isn’t exit/ return enough in such a case…? Anyway one thing that I would like to highlight today is testing. Seen many entries where single typo made huge difference, including turning 5/4* script into 1* script. 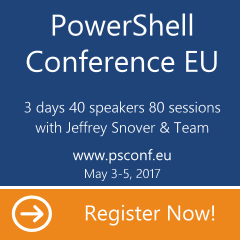 And because with PowerShell we got huge power, and with power comes responsibility – testing is more important than ever.